Hi all–as you know Coachella went down last weekend and will continue to parade on this weekend. Although I was not in attendance, I still wanted to celebrate the fashion vibe that erupts from that event. For starters, I have ALWAYS been afraid of crop tops. Every time they come back into fashion I cringe! But the fashion blogging community has given confidence on how to style this tricky little number. We can all thank this American Apparel skirt for holding this outfit together. The high waisted knee-length skirt gives this outfit a good base and shows just a tiny bit of skin. I got this number years back and it’s lasted many seasons. I just googled it for ya AND they still sell it, here’s the link if you’re interested. $28 bucks and 4 years later, I’m still happy with it. 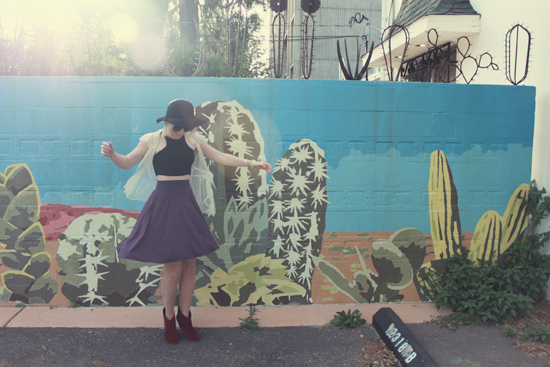 I have previously worn these skirt, see how I styled it here, last year during the summer season. I personally like how I’ve styled it more this time around. And that’s EXACTLY what this blog is for. Learning how to remix my closet to better use the items I already own. Isn’t it crazy to think the amount of combinations you could come up with by just using the items you’ve currently got in your closet? 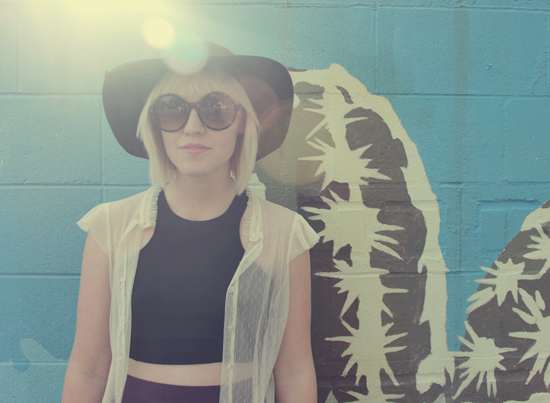 That’s what keeps me excited about continuing this blog and creating new looks each day. Can I just point out that this photo shoot was unplanned? 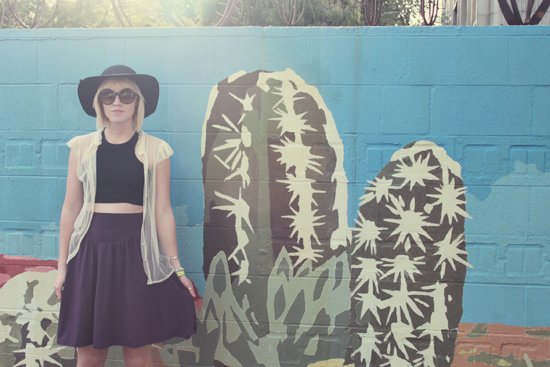 This mural could not have played a better backdrop for my “nochella” outfit. I mean talk about pure luck. Thank you for snapping these shots Haley! Maybe someday I will attend Coachella. Did any of you go? You look gorgeous! That crop so suits you. I’m not big on festivals; too many people for my liking! I did love seeing Kate Nash at Splendour in the Grass a few years ago. That was awesome. You look great in the crop top!